Engaging and ready-to-go project that provides excellent support to the history, writing, and literacy curriculum to engage students and motivate students for learning. Tie in black history / women's history month, President's Day, or created your theme for this wax museum. Students can write a 5 paragraph research report or the graphic organizer can be used in place of the report for differentiated instruction. Choose what you want and then print! There are 6th-8th and 9th-12th versions available! *3-5th Grade Common Core Aligned. *You can choose with or without Common Core State Standards on your requirements page. *There are reference choices for MLA, APA, and CMS formats. *There are <strong> student choice, scene backdrop, and tri-fold versions</strong> as options for this project. 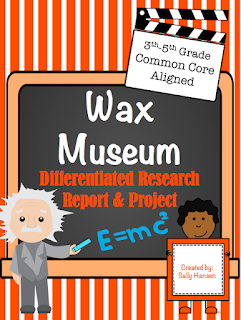 *Great for mixed or leveled classes to give students differentiated instruction. *Requirements and guidelines are detailed and organized. *Students know exactly what to research with the outline. *Students will write a 5 paragraph research report. *Gives students a choice for their character representation. *Practical and easy to understand rubrics for teachers, parents, and students. *Permission slip to inform parents. *Easy scoring on a 10 points each category out of 100 points for the rubrics. Or the rubric totals up to 100 points. *Zip folder contains 2 PDFs and 1 PowerPoint. Students enjoy this project! This is a 2-3 month project. Each class is different and each year is different; therefore, I can't do everything the same each time I teach the same subject. I give each student a three pronged folder with the packet inside. As I scaffold and model the information to my students, I have students write in the due dates. I make this an at-school project and have students keep their research folder in a designated location. Also, you can choose themes for your project such as children’s authors, presidents, Native Americans, American Revolution historical figures, American heroes, African Americans, famous people/Americans, scientists/inventors, composers, or historical figures from your state. The choice is yours! I decided to keep the requirement pages for the variations/differentiation choices grouped together in each category. I thought this would be less confusing for the teacher when deciding what to print out for his or her students. It will state “Same as page #” next to the page description in the table of contents.